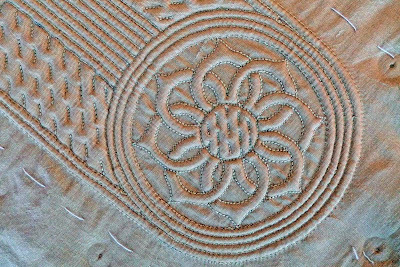 Boutis is a play of light and shadow created by first, stitching the motifs and channels of the design (created specifically for boutis), and then inserting cotton yarn through these same channels. It's with the addition of the cording that the relief is created and this is what defines and gives life to the patterns and motifs of the piece. When working boutis, the cording process is just as important and time intensive as the stitching. That being said, the little mobile phone pouch on silk that I have been working on is finally stitched and corded. Stitched and corded, the little silk phone pouch that I have been working on is ready to be assembled. Once all of the cording was completed, I soaked the piece in cold water and tacked it tautly it to a sheet of Styrofoam. This is the opportunity to square up the finished piece of boutis and ease in (or out) any irregularities. 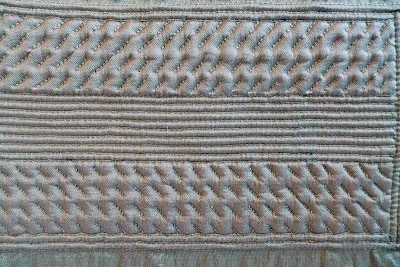 In my post of February 11/2014, "Boutis: The Straight and Narrow of Silk", I was describing the difficulty I had stitching the diagonal lines (shown below) accurately because the glare that my working light created on the silk made it very difficult to see the stitching lines. Notice the difference between the bottom half of the pattern, which is done correctly, and the top half, which is stitched very inaccurately. My hope was that the cording would camouflage some of the poorly stitched lines. 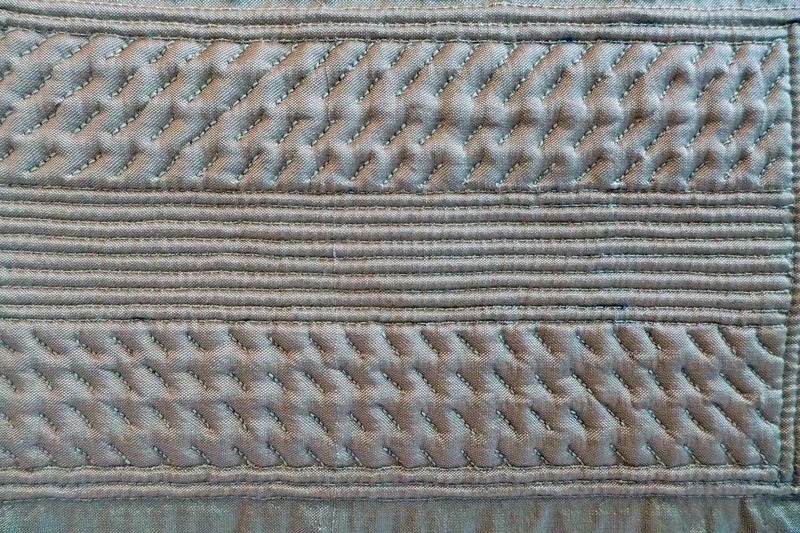 Now that the cording is completed, the stitching imperfections are still quite visible, however, from a distance and if not scrutinized too intently, they may not be too obvious. This pattern is known as "point de vauvert". 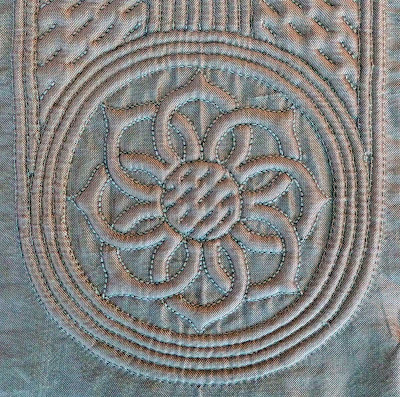 It's a series of off-set short lines stitched with a variation of the back stitch and later corded in several directions. The next 2 photos show a close-up of the stitches I used on the front flap. The first is of the right side of the pouch, the second is the wrong side. 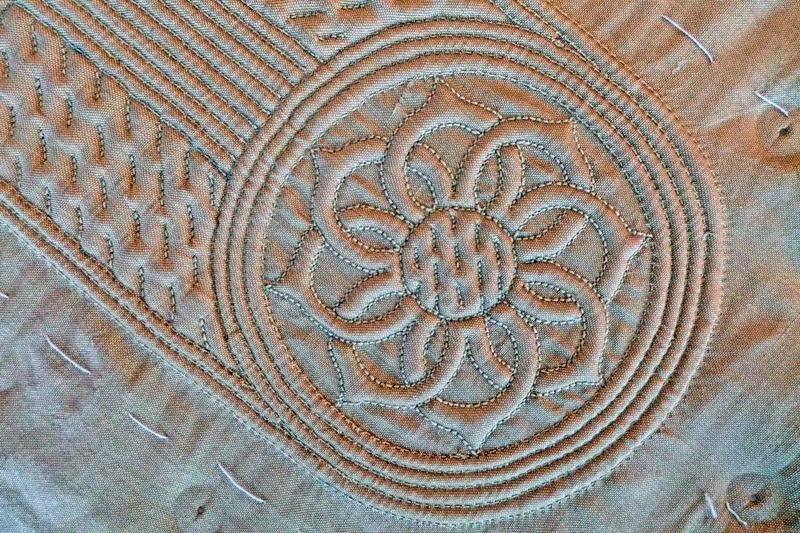 The centre circle of the rose window has been stitched with "point d'arriere" (back stitch). The circular channels surrounding it and the long, straight channels on the rest of the pouch are just a simple running stitch. 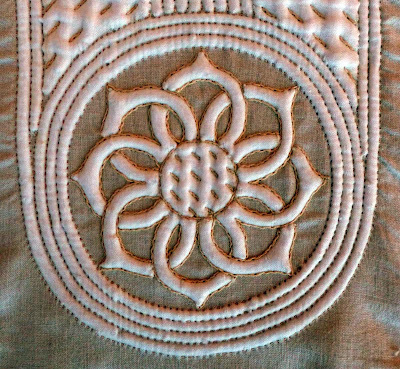 While the centre of the rose window and the area between the long channels are stitched in "point de vauvert", which uses a variation of the back-stitch. The back side of the boutis. In a perfectly stitched work of boutis, the piece should be completely reversible. Not there yet, but we'll keep working on it! Since finishing this project, I have started several new designs and am currently stitching the first one. I have acquired a new work lamp with a magnifying lens where the light is much easier to direct and control. I have also implemented some changes in both the design and in transferring the design onto fabric, that I hope will allow for greater accuracy. I'll write about the changes when I post a blog about these new projects. This little cell phone case is going to be a work of art! 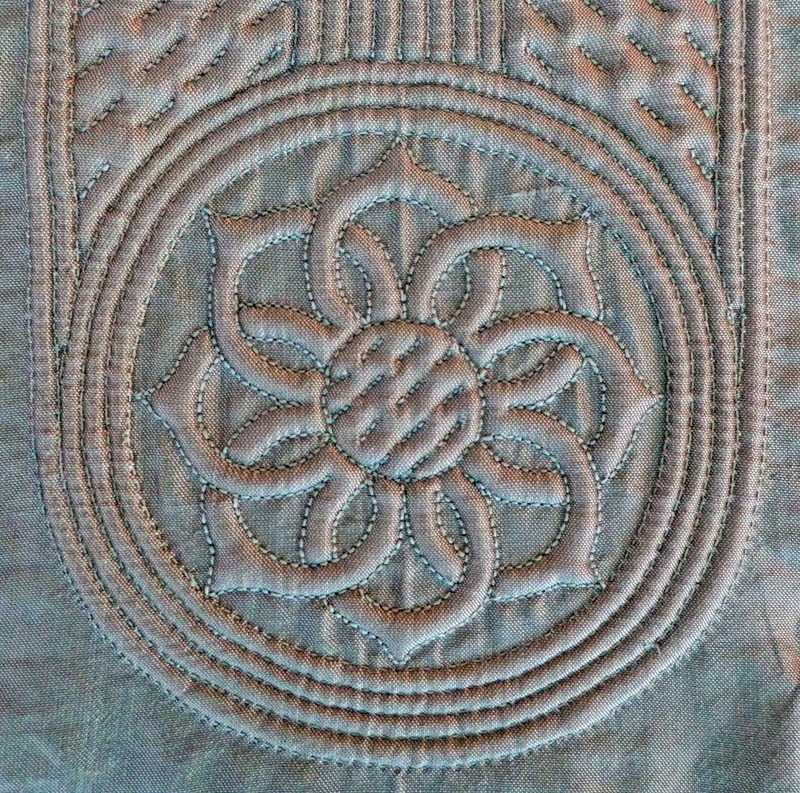 It's funny, nearly every time you run a post about boutis I pour over your descriptions (which are very good, by the way) in the hopes of understanding the secret behind this beautiful needlework. And I've never been about to figure out how you fill the channels. Last night it finally dawned on me to look it up on YouTube. AMAZING! I'm just so impressed by the artistry and skills involved in what you do. Thanks Michelle. I'm working on some posts that describe the process and techniques of boutis, so one of these weeks (or months! ), I'll get them posted. In the meantime, I want to make a little "critter" bag for a special 3 year old, so I am scouring your blog for some inspiration and good ideas on the subject, which I know I will find there. The rose window is exquisite! Absolutely lovely! While I'm not a fan of primitive work, or anything that could be classified as sloppy, deliberate or not, that is FAR from the case here. It looks perfectly wonderful, and has just the right amount of variation to give it life. I love that filler stitch along the sides. I'd be interested to know how it was corded - do the cords cross over inside the fabric? Hi Monica. I've missed your comments. 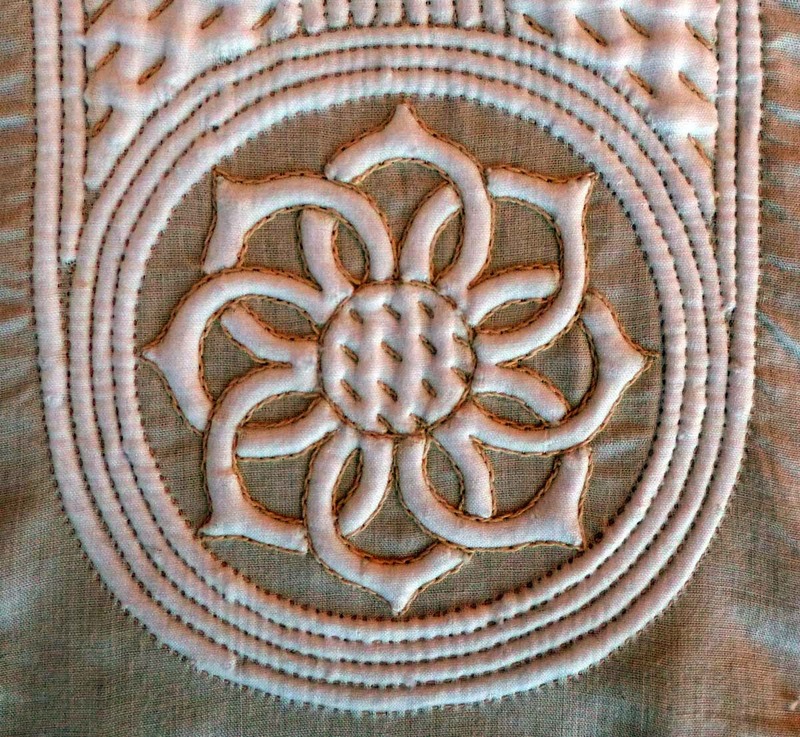 The pattern on the sides, called "point de vauvert", gets corded in 3 directions. Others have asked about that as well, so I'll post a quick description of the process one of these days. It's really quite easy.